Mother’s Day is right around the corner. 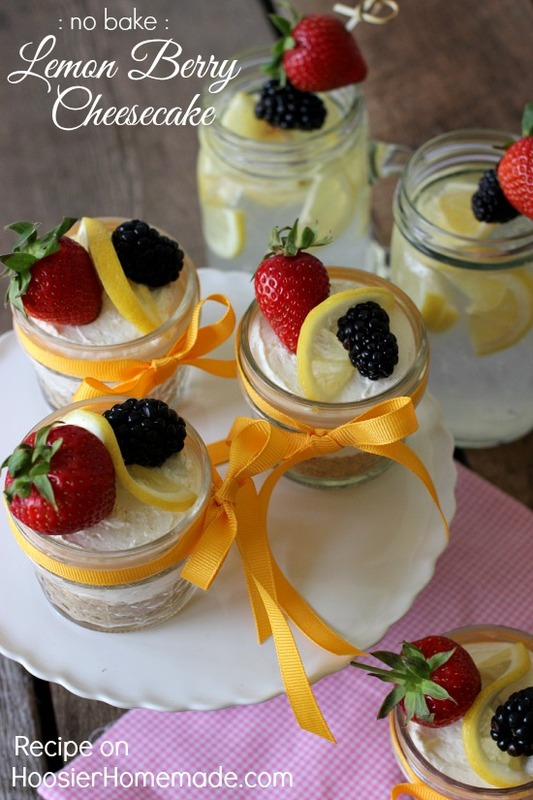 Will you be baking a special Mother’s Day Dessert? 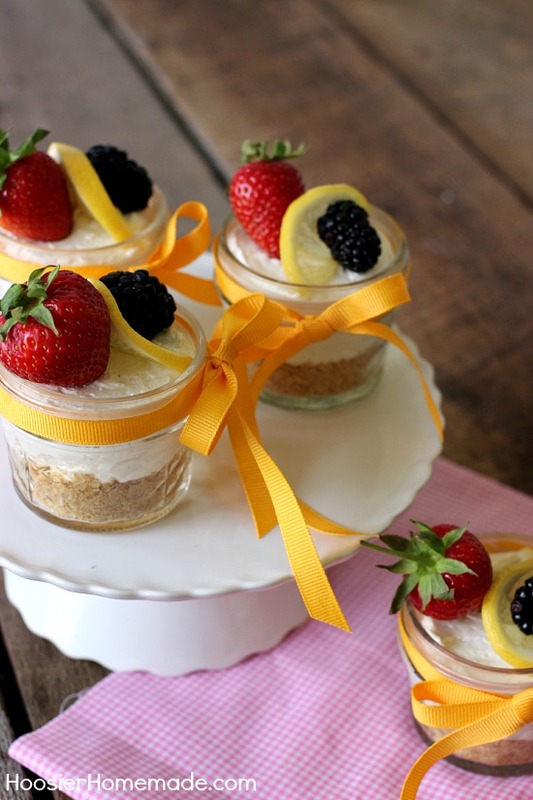 These Lemon Berry Cheesecakes are light and refreshing with lemon and strawberry flavor, graham cracker crust and topped with fresh berries. There are many different ways to serve cheesecake, and although the traditional way of baking a cheesecake in a spring form pan is great, I love serving guests individual servings. Perhaps it’s just me, but I think it’s more fun to have a dessert all to yourself that you don’t have to share if you don’t want to. 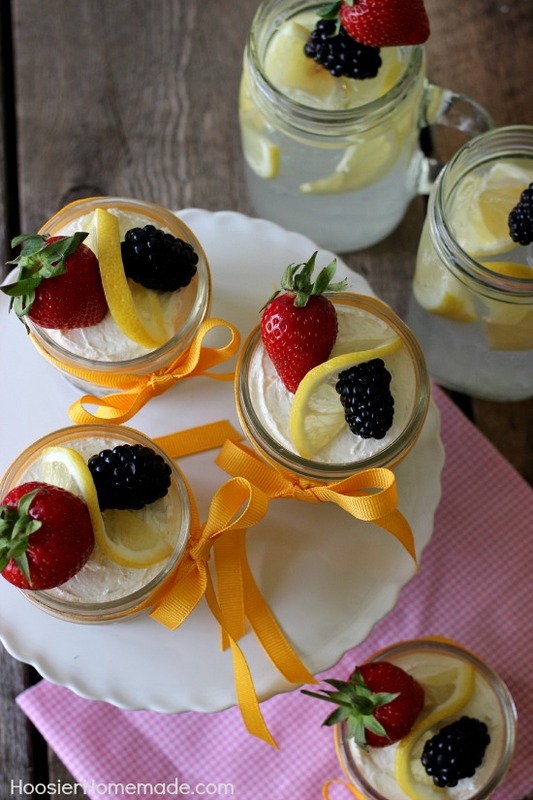 These Lemon Berry Cheesecakes are served in 4 oz canning jars. You can find them at Walmart and most department and craft stores. This recipe for Lemon Berry Cheesecake has very simple ingredients, starting with a similar recipe that I shared before, Cotton Candy No Bake Cheesecakes. The flavor is changed with lemon and strawberry extracts, the combination of the two made the cheesecake very flavorful yet refreshing. Just like the Sugar Free Fresh Squeezed Lemonade I shared earlier this week, I added Truvia natural sweetener, a natural, great tasting sweetener born from the leaves of the stevia plant. It has zero calories and zero fat. When I think of Spring, I think of light, refreshing flavors like lemon, lime, strawberry and more. So when I was thinking of a dessert to serve for Mother’s Day, it needed to be refreshing like Spring, beautiful like our Moms, and of course delicious. Growing up, I remember my Mom baking a lot, especially for the holidays, and yes, even on Mother’s Day, she would cook and bake a huge meal for all the kids to come over and celebrate. My Mom also spent a good portion of her time in her garden, her and my Dad loved their yard, flower beds and garden more than anything, and would spend hours and hours on their knees working to make it beautiful. My Dad had a couple different berry patches, a large strawberry patch and also a few berry bushes that he would pick from, and bring them into the kitchen where my Mom would make wonderful desserts. 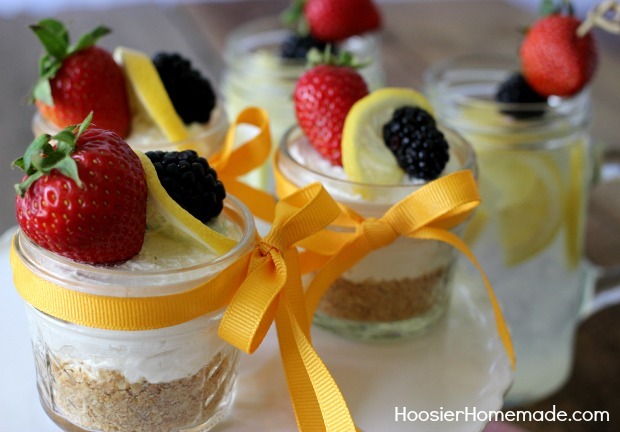 My Mom would have loved this Lemon Berry Cheesecake with fresh fruit on the top. 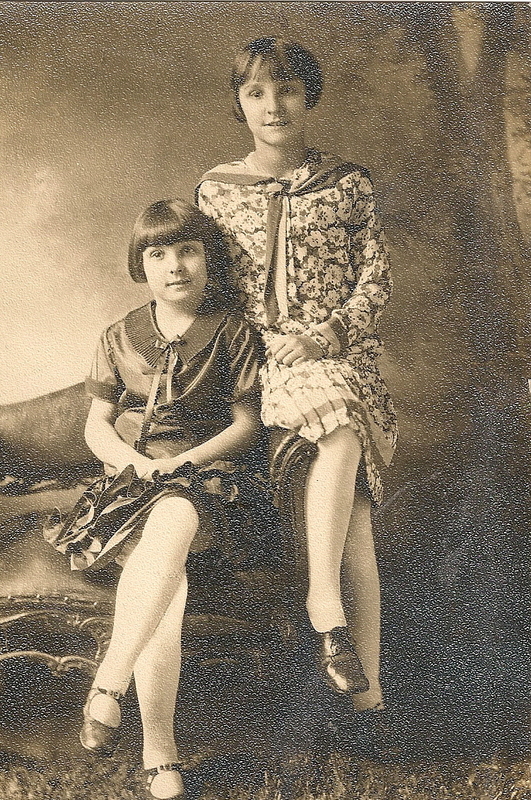 This photo is my Mother and her sister. I’m not quite sure what year it is, I’m guessing late 1920’s, since my Mom was born in 1919. She would have been 95 last month. We all miss her dearly, she was definitely a remarkable woman. Melt butter in microwave and add to graham cracker crumbs, stir well. Mixture should hold together, add more butter if needed. In a large bowl, cream together the cream cheese and sugar until well blended. 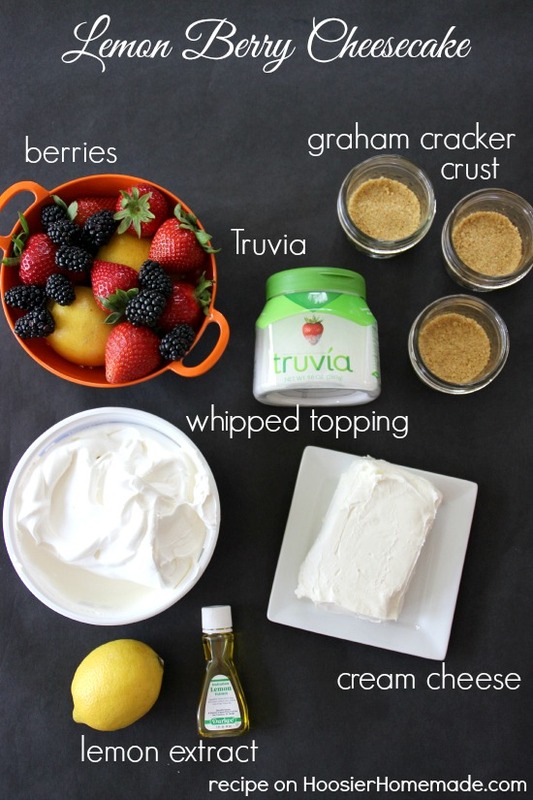 This same recipe can also be made in a regular size pie. Just form the crust into a spring form pan, and add the cheesecake. Let chill for at least 3 hours. 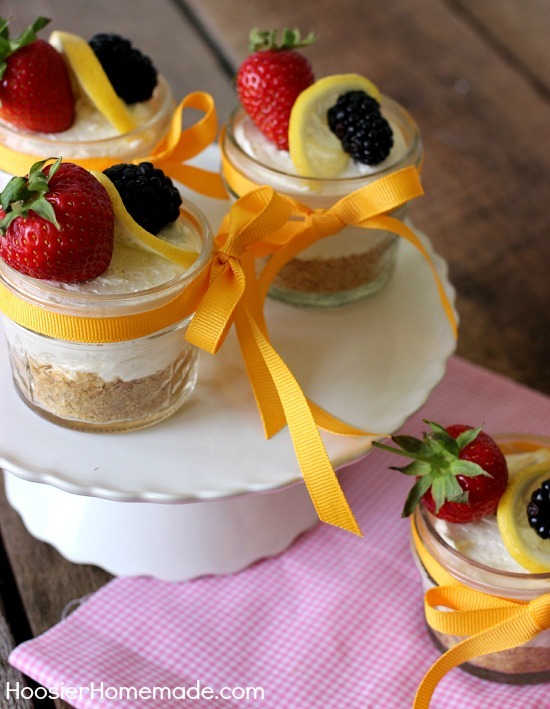 These are just the cutest little cheesecakes! So pretty for showers or parties this spring! Thanks so much Robyn! I love serving individual desserts, don’t you? Love <3 <3 Hoosier Homemade! What a great site, full of awesome ideas for the home, yard, holidays, so many fun things to do with the kiddos! Thank You Miss Liz You Rock! My favorite website!